Today’s contribution to my usual irreverence was to refer to the above image as ‘The CAT-Scan of Christ’. I bought some new shoes this weekend. They are a bit stiff and my punishment will be to break them in to mold comfortably to my feet. I found a diversion on Saturday afternoon by reading the archives of Lady Sabre and The Pirates of the Ineffable Ether. That was fun. It looks like their Kickstarter campaign to fund a trade paperback has been successful. I’m tempted to put in an order with Graphic Comics for a copy when I hear it has been printed. Finally, I went and saw Rigoletto at the Rialto this afternoon. The Met Opera set it in 1960s Las Vegas. I wasn’t convinced that the story of the curse works in such a modern setting. The sets were wonderful and the popularity of the opera attacted a bigger audience than was usual for a screening. The next opera is Parsifal and I looking forward to it. I have it on CD and despite its length it has a lot of beautiful music. I suspect it might prove to be more accessible to me than the Ring Cycle. I’m looking forward to discovering why Jonas Kaufmann is wandering about looking like a factory floor worker. I’m aware that I’ve getting a small number of hits from people looking for websites with the Norwegian cartoon Nemi in English. Primarily they are hitting a page I had of a favorite Nemi comic strip. If that’s what you are here for then I’ve added a link to the London magazine website Metro to my blogroll. They seem to be the only people who are translating and publishing this comic. The page only shows the current week. I’m sure they used to have an archives somewhere. It would be a shame if it’s lost! Anyhow scroll down to the link Nemi Cartoon by Lise Myhre in my blogroll and you can get to the page from there. Good luck! I was down in Invercargill during the month for my brother’s 50th birthday celebrations, Boston T.. I stayed with Southern Dave and took the opportunity to browse through his extensive library for things I should read. Over five days I had time to read four of his books. I shall wear midnight, the most recent Terry Pratchett. I had heard that this was darker than his earlier books. Before reading it I had put it down to the fact that the onset of Alzheimer’s disease had given him intimations of mortality. On reading it I found it to be deliciously dark and enjoyable. He also re-introduced one of his earliest characters whose fate I had always wondered about and identified several paragraphs before being revealed in the text. The Fuller Memorandum by Charlie Stross. The latest in the Laundry series. That man is evil! The Last Watch by Sergei Lukyanenko. I’ve gone off the Russian Night Watch series. There seems to be little choice between the libertarian Dark and the paternalistic snobbery of the Light. Gack! I’m not sure if this book had anything to add. Peter and Max: A Fables Novel by Bill Willingham. Willingham takes characters from his successful Fables title in Vertigo and writes a book. It’s a reminder to me that characters from visual media: graphic novels and television, do not easily cross over into written media. They come across as two-dimensional in books to me. Since returning to Dunedin I have bought a copy of Kraken by China Miéville. It’s not so much Gosh Wow as his New Crobuzon novels but it has several moments of the fantastic descriptions that have become his trademark. Because it’s set in London it feels closer to his earlier novel UnLunDun in its story telling. Two of his villains feel like a hat tip to the archetype that Neil Gaiman used in Neverwhere as Croup and Van Der Meer (I think that was their names). I would be happy to get Goss and Subby out of my head. They are creepy and terrifying! One moment in the denoument had me cheering because Metadata Is Important! Only a cataloguer can appreciate that moment. Also it was nice to see a character who’s a member of a squid cult who is motivated by its distinct ethos and theology. It makes a nice difference to fleshing out a character. And finally FreakAngels volume two by Warren Ellis and Paul Duffield arrived in at Pop Fiction this week. I have asked to get the next volume for me. Both Kraken and FreakAngels are welcome additions to my book shelves. Q: What can jump higher than a house? I don’t know what is cooler in this comic: the concept of steampunk-rock, or the range of emoticon coffee mugs on the shelf. On Good Friday afternoon I realised that I hadn’t seen my cellphone since Thursday. A search of my room produced no results. I visited a couple of places I had been on Thursday. It was not to be found there. I tried phoning my cellphone number and got my answerphone message — which means it is not on so I couldn’t hear if it was ringing somewhere about the house. This is a frustrating loss as friends do call it to contact me. If I don’t find it by the first week of April I will have to replace it as I will need a cellphone to be in contact when I go on a roadtrip with my mother to Wellington. Listening to my answerphone message is funny. It is not the voice of me that I usually hear myself. My inner ear hears the intonations from my mouth whereas my external recorded voice is more nasal. It’s strange, like listening to another person, not me. A couple of friends might be interested in the Strange Maps, a blog of unusual and imaginary maps. No cadastral maps, at least one usual suspect will hate that. I’ve added some new blogs to my RSS-feeds. The Guardian has a monthly feature of recommended blogs. I grab the feeds and read the backlogs. When I’m finished I keep some of them. The following image shouted Majellan at me. 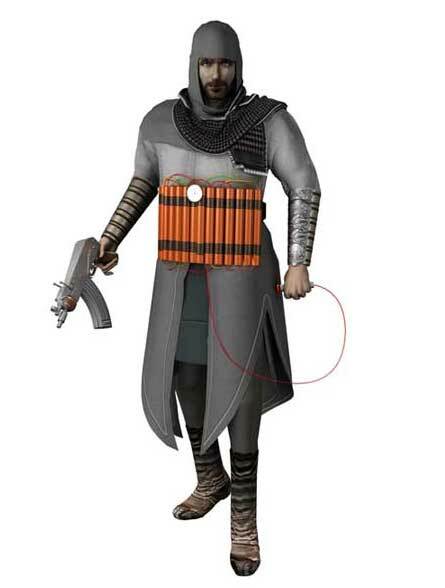 The image is the Virtual Jihadi and comes from a satirical video game on the occupation of Iraq. I tagged along with friends to the Backstage last night. I had seen the posters for it. I didn’t know it was a music venue. I thought it was the name of a band. So I am further educated. The first singer up looked like Steve from Questionable Content. I think I’m about to go out for takeaways before a GURPS session. So I think I’ve included everything I wanted to report. I know Ranka has posted this one to his account; and Charlie Stross also links to it on his blog. I refer to the goodbye salute to Gary Gygax on xkcd. I mentioned to friends today who got the joke.